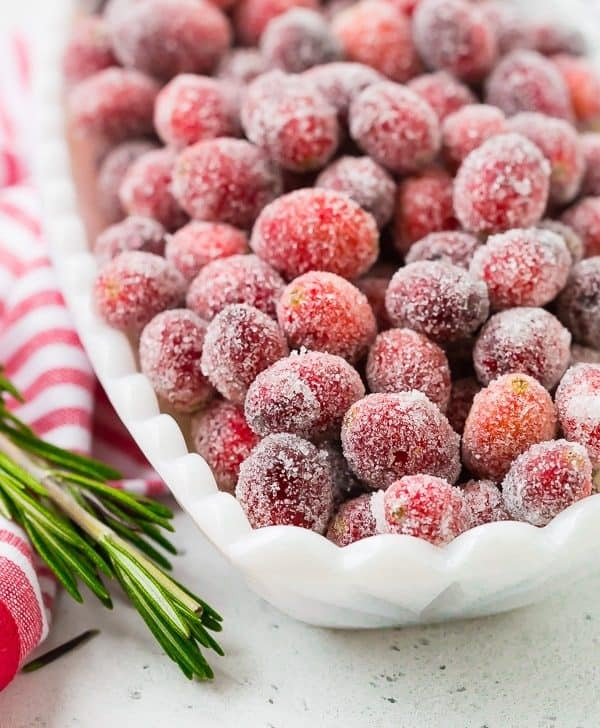 Whether you call them sugared cranberries or candied cranberries, they’re the perfect sparkling garnish to nearly any holiday dish or cocktail. They’re great on their own, too! 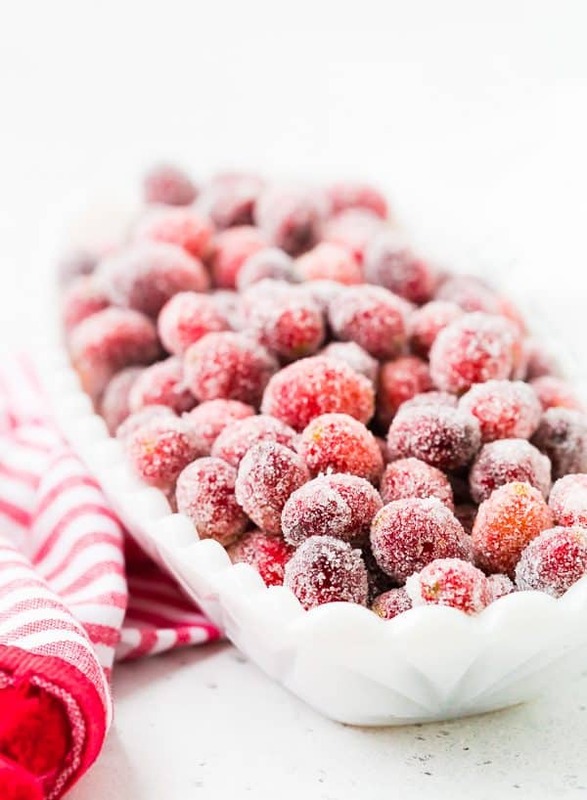 Aren’t these sugared cranberries the prettiest little things? I loved sprinkling them all over that amazing Baked Brie I shared last week – they were the perfect sweet tart complement to the sweet cranberry sauce and bourbon candied pecans. They’re like little jewels for your food. I’ve also had them on this great holiday appetizer – it’s such an easy and tasty recipe! 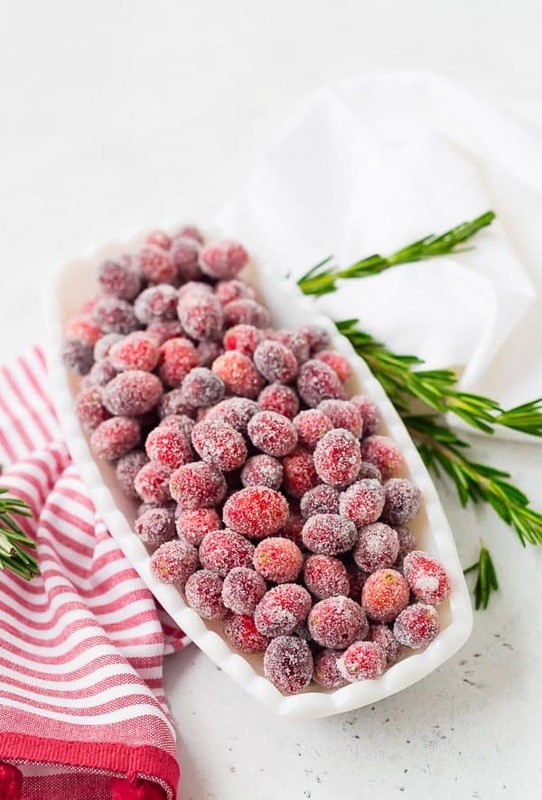 They’ll also look stunning on a refreshing holiday cocktail – try skewering them on a pretty toothpick and resting them on top of a champagne glass….so pretty! They’d look pretty on these pomegranate mojitos, too. Best part? They’re super easy to make so they’re a great last minute addition to your holiday plans. I’m thinking about sprinkling some of these onto the charcuterie platter I’m planning on making for an appetizer. They’d look pretty and they’d also taste great with the cheese. Wash cranberries and sort out any that don’t look so great. Make a simple syrup – sugar and water. Coat cranberries in the simple syrup and spread onto a baking rack to dry for an hour. Roll in more sugar…and you’re done! They’re so easy and so fun. The contrast of the tart cranberries is so so good with the sugary coating. 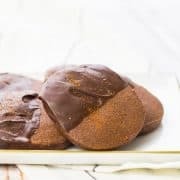 You guys will love these, and everyone will be so impressed by you! 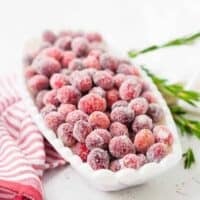 How long do sugared cranberries last? These will last for a few days in your fridge. If they start to “weep” a little, just give them another quick toss in sugar to freshen them up. 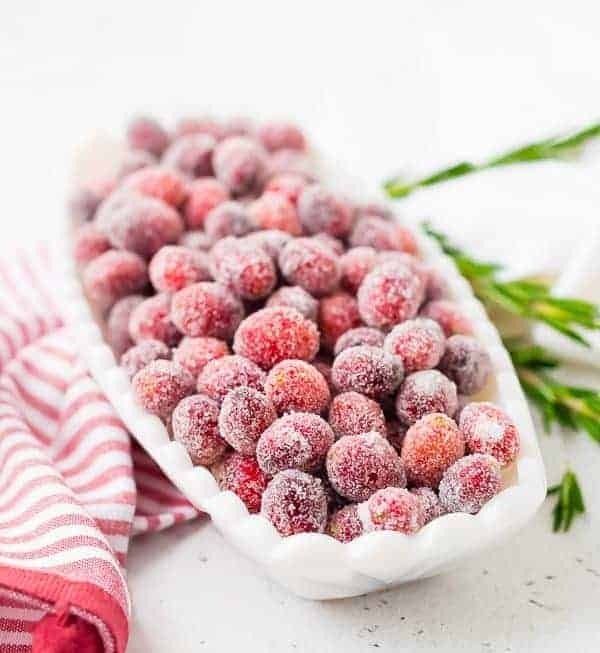 How do you store sugared cranberries? Store in an airtight container in the fridge. You can also reserve the syrup and use it for cocktails. 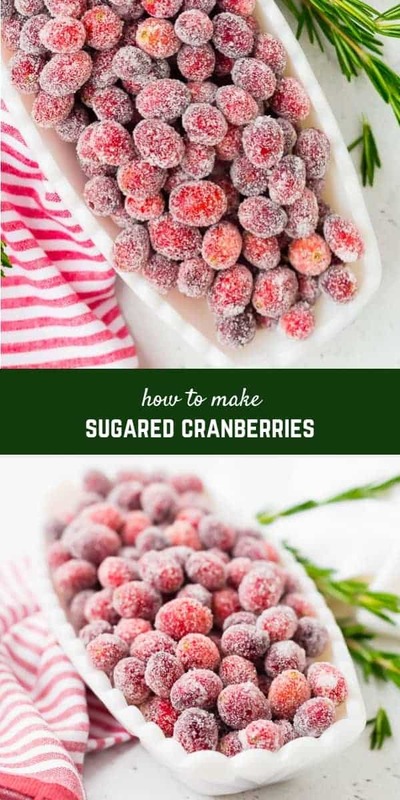 What can I do with sugared cranberries? Try sprinkling them on a cake or pie, on a cheese platter, in a cocktail, or just set around in bowls because they’re so pretty! Can I add flavor to candied cranberries? Sure! 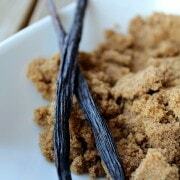 Try adding some vanilla bean (the pulp of the bean) to the sugar that you roll these in. Or you could add some orange zest to the sugar. 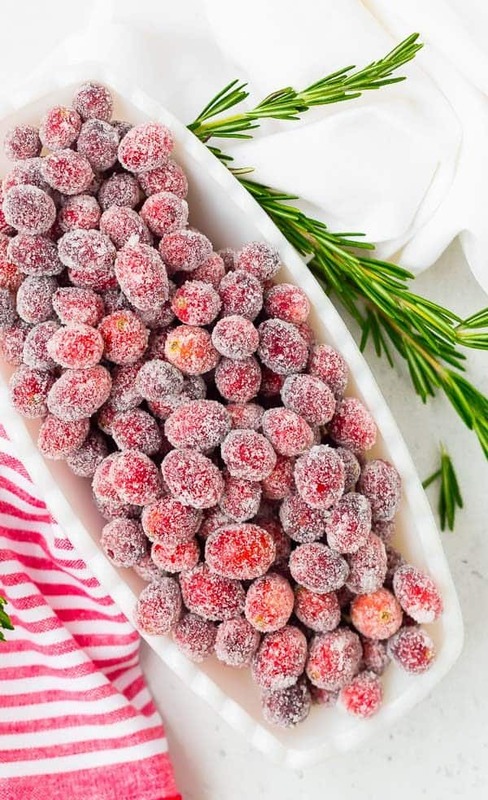 Whether you call them sugared cranberries or candied cranberries, they're the perfect sparkling garnish to nearly any holiday dish or cocktail. They're great on their own, too! 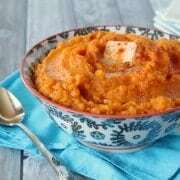 Combine 1/2 cup sugar and 1/2 cup water in a medium saucepan over medium heat, stirring, until sugar is dissolved. Do not boil. Stir in cranberries and stir to coat all cranberries. Use a slotted spoon and transfer cranberries to a wire rack (set it on top of a lined baking sheet for easy clean up). Reserve syrup if you want - it's great to sweeten cocktails! Let cranberries dry for 1 hour. After one hour, roll cranberries in remaining sugar until completely coated. These may start to "weep" some liquid after 2-3 days. If that happens, you can re-roll them in sugar to extend their life. Verdict: Love these little gems! Husband’s take: I’ll let you know…I don’t think he’s tried them yet! You’re welcome! I hope your children love these! pop them in some champagne. Yes! Such a fun and festive idea.